Dhaka Dynamites clinched a dominating 99-run victory over Rajshahi Kings in the 36th match of AKS BPL 2017 Powered by Shah Cement. Winning the toss, Dhaka Dynamites opted to bat first at Sher-e-Bangla National Cricket Stadium (SBNCS). Sunil Narine and Joe Denly gave Dhaka a flying start with a partnership of 129 in just 13.1 overs. Narine was dismissed after scoring 69 while Denly scored 53. Kieron Pollard’s quick-fire 33 ensured Dhaka to score past 200 runs. Dhaka posted 205 for 5 after 20 overs. Kazi Anik picked up 2 wickets for 52. Chasing 206, Rajshahi Kings had a nightmare start as they lost 4 wickets for just 19. Shakib Al Hasan led the attack with 3 wickets in his opening spell. Rajshahi lose wickets in regular interval and were all out for 110 in 18.3 overs. Shakib grabbed 4 wickets for 8. 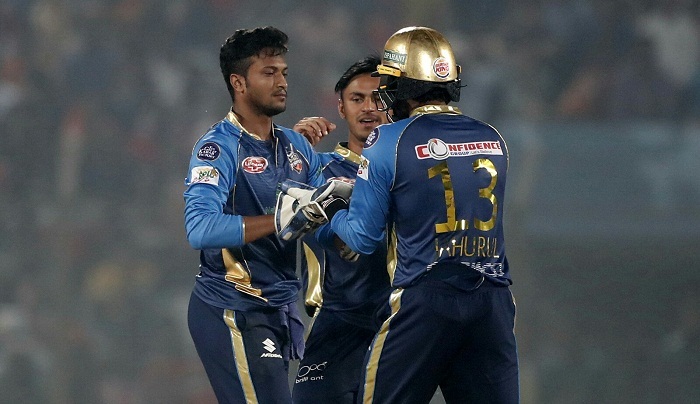 Result: Dhaka Dynamites won by 99 runs.